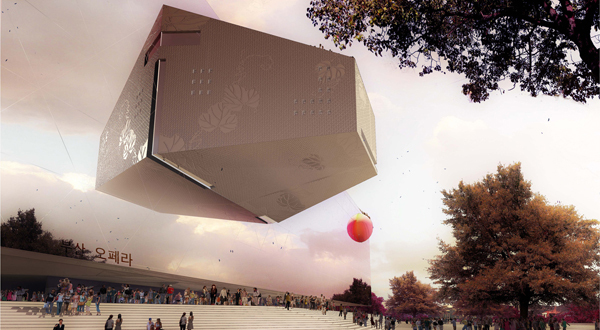 Architects at international office Sériès et Sériès believe that experiencing the drama of opera must begin with its vessel and therefore they advocate new role of opera house in creating a dramatic experience that begins before the curtains draw open and lasts well after. The Opera today not only represents cultural identity but is there to create and shape growing cultural awareness. It is no longer just a passive playground for elite but an interactive experience, responsive to our aspirations and expectations. It is place to meet and socialize in a common cultural context, a spectacle that requires whole new attractive, open and inviting typology. Inauguration of the new station took place in late 2012, six years after the restricted international competition was held. 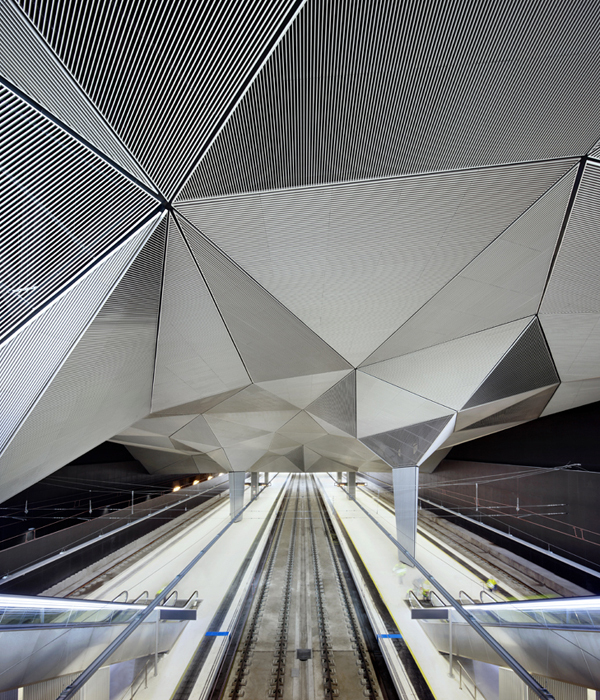 First phase of this winning entry is now completed – High speed train station in Logrono, by Abalos+Sentkiewicz Arquitectos, has finally welcomed its excited users. This is only the beginning – wider redevelopment project consists of bus station, parking, housing, park and urbanization of the area. The park and the urbanization are still under construction. 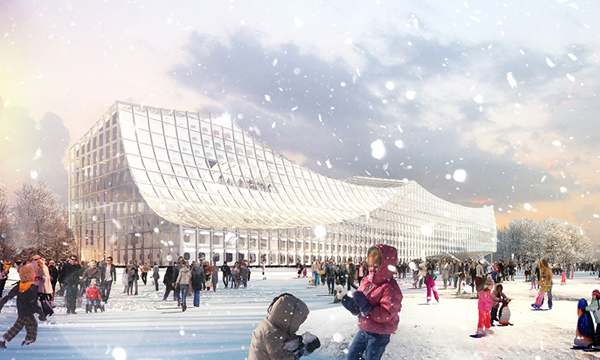 In their design for Helsinki Central Library, PAR | Platform for Architecture + Research and Arup re-investigate public space and its relation to the important city landmarks. 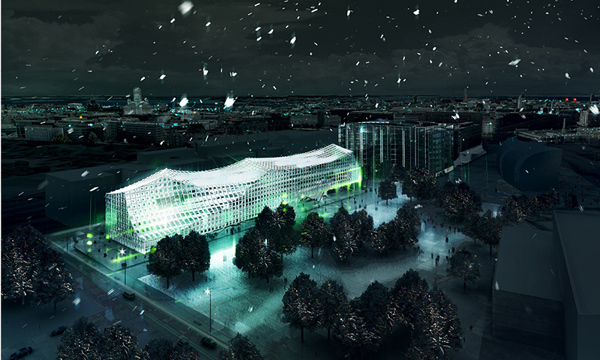 Their competition proposal was inspired by Helsinki’s expansive skyline, the urban development of Töölönlahti district and the rich Finnish heritage of social openness. 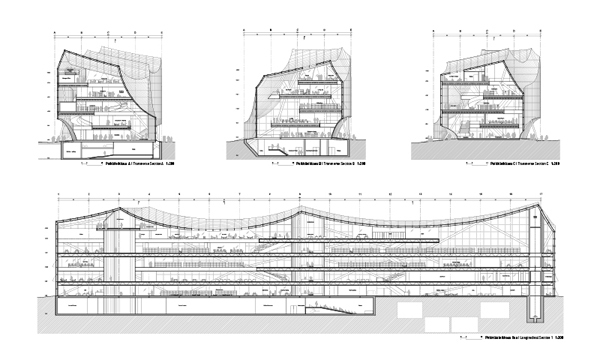 Prismatic volume of the library building, conceived in careful play of stacked spaces extruded to the maximum height, offers great variety of atmospheres. Public void on the ground level mimics urban surrounding, inviting visitors in. 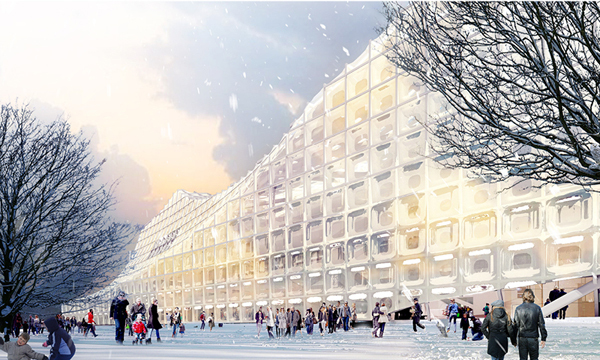 Programmatic strips are superposed and create very narrow building, optimized for Helsinki climate conditions as well as the library program. Six floors of the building are pointing in different directions – positioned along six main axes, all levels afford thoughtfully chosen views. Strips feature 11.5 meters deep plates which enable flexibility in collections layout and maximize diffuse natural light – of crucial importance for the ideal reading environment of the library. The broad, undulating shape of the roof rises to a total height of 31.8 meters, sloping down to the northwestern end, where the roof is 22 meters lower. The program of this glacier-like library is flexible, due to constantly changing, almost immaterial ways of accessing and sharing knowledge. 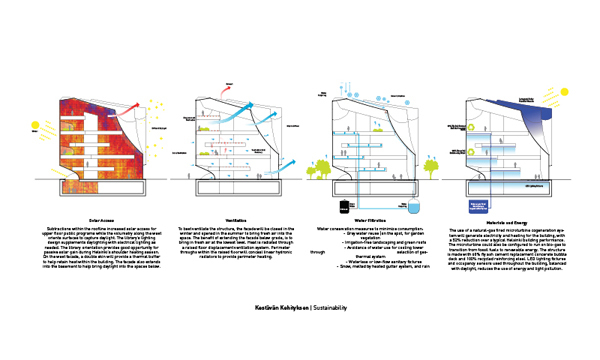 Flexibility of the interior affords necessary level of adaptability to future alternatives. Open plan zones and freestanding shelving enable spontaneous configurations of the used space. 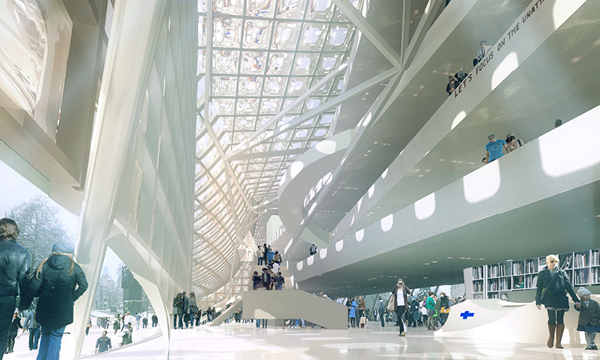 Led by zero carbon emission objective, the design of the Library was directed by package of necessary environmental analysis, aiming to optimize sustainable performance of the building form and crystal envelope. Used passive and active strategies such as site integration, natural light autonomy, high thermal performance facade, micro turbine cogeneration, recycled materials and natural summer ventilation reflect highest level of environmental awareness. 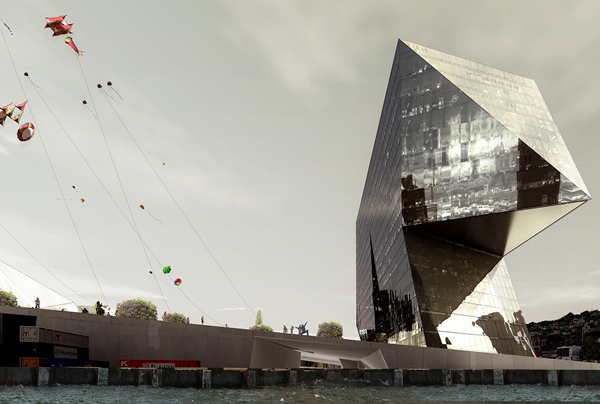 Inspiring entry for the Taiwanese Keelung Harbor Building competition by LA-based PAR | Platform for Architecture + Research and SES | Sériès et Sériès was one of five finalists, along with four international teams – Neil Denari, Asymptote, Mecanoo and ACDF. The aim of the architects was to propose highly contextual design solution which would generate and structure the open space it was part of. The outstanding form is a successful outcome of combining maximum efficiency with serious artistic aspirations – cantilevering edifice of the tower frames the space of the harbor, becoming its landmark. 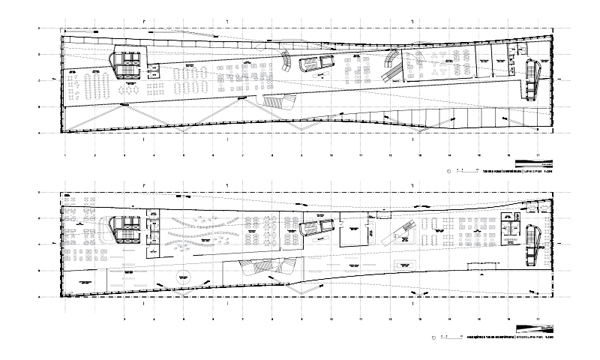 Located at the end of Keelung’s harbor master plan, this proposal for the Terminal provides continuous open space, linking public and waterfront facilities. Green roof of the Terminal building generates landscape condition. By establishing continuity of the network, the waterfront and the port terminal development are planned to be within easy reach of many residents in the central city. 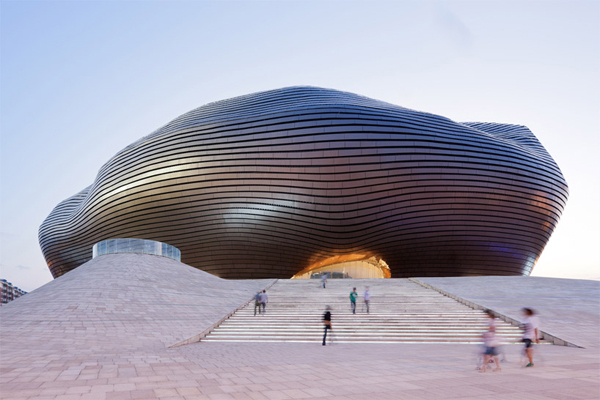 42 thousand square meters of museum space in new center of Ordos, inner Mongolia, is designed by MAD Architects. Driven by booming economy, Municipal Government of Ordos decided to create brand new city, far away from the current one, on the site of Gobi Desert. Conceived as a reaction to the rigid and conservative geometry of the Master plan, inspired by symbolic image of “The ever rising sun on the grassland”, brave new Museum building drastically confronts inferior urban grid, existing only as a pattern on the paper. 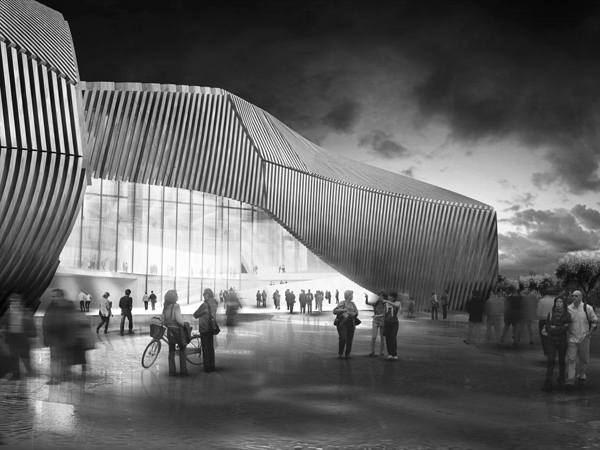 Although the design may seem unengaged in the historical context, it actually investigates the future of local culture. 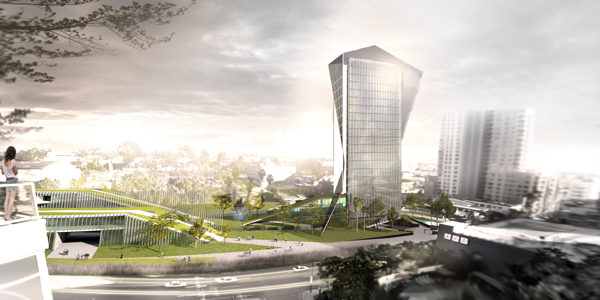 RTA-Office’s entry for Kaohsiung Port Terminal Competition reinvents the topography of this Taiwanese waterfront. 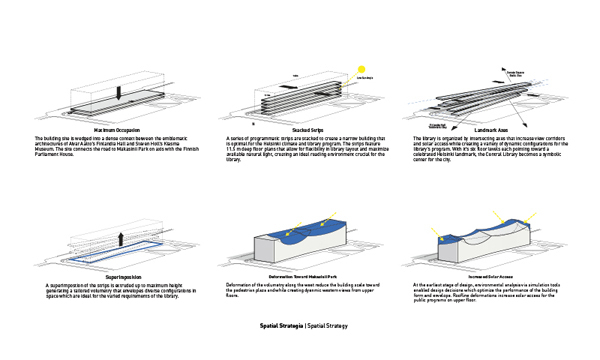 Building emerges as a colossal geographical element, establishing the idea of a new and improved landscape. Santiago Parramon’s stunning new architectural statement re-examines relationship between contemporary user and the object – being obsessively engaged into condensed and constantly changing scenery, users actually avoid devoting themselves to anything in particular. In order to overcome the issue, overwhelming geometry, along with restless skin of the building, requires additional attention of the consumer and higher level of mental engagement. 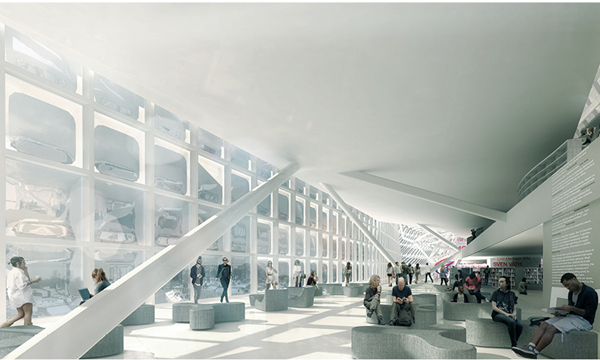 New Dalian Planning Museum in China, by 10 Design, is a modern, first-class venue for offices and exhibitions in the heart of the government district, advocating cultural engagement within the city. It is one of seven municipal civil projects funded by Planning Bureau – along with library, urban planning exhibition, scientific center, museum, and teenage activity center. Building’s sculptural appearance is in a direction of promoting landmark architecture in Dalian. 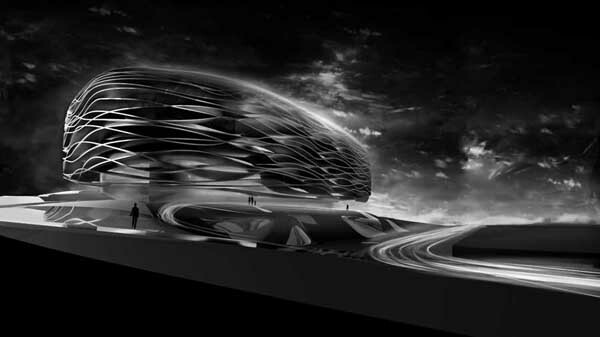 Striking edifice is also a temple of technical innovations and progressive sustainable concepts. Clearly inspired by nautical forms, the design also aims to become a symbol of technological perfection and green architecture. Museum’s envelope is active and maintenance-free – the building uses photo catalytic nano-coating of titanium dioxide on the outer zinc rain screen to neutralize air pollution and remove dirt. UV lights powered by photovoltaic cells perform the cleansing reaction at night, while incorporating a figure of a blooming flower, an important symbol to this Chinese city. The great fact is that this dramatic performance comes at no cost – nano-coatings are simple paints in a very thin layer. The design for Peoples Meeting Dome in Bornholm, Denmark was practical response of young Danish architects, Kristoffer Tejlgaard and Benny Jepsen, to a debate about future of housing. 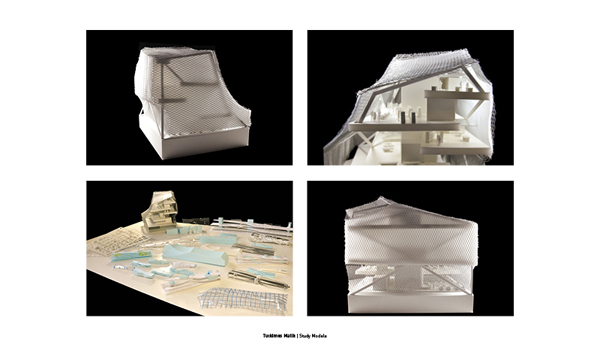 Their ambition was to create outstanding and highly optimized architecture, yet site-specific and contextual as possible. The proposal was deconstructed geodesic dome – still rational and mathematically generated, but with the improved aesthetic qualities and towards attractive, humanized and inviting architecture. 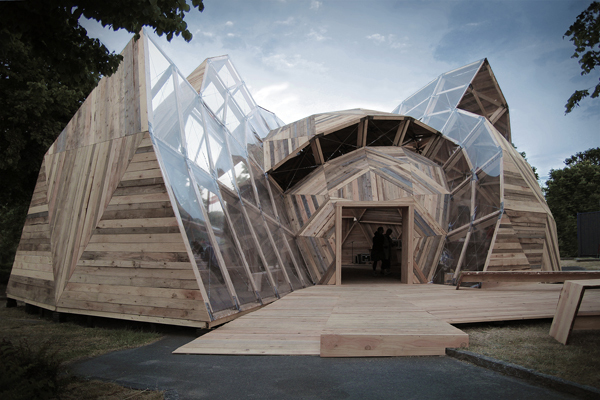 Structural frame of their intriguing edifice, a meeting place and the exhibition tent for the Danish National Association for Social Housing, is triangular and adaptive – sacred geometry is flexible so the dome could be shaped by the local surrounding and the particular uses of the project. The envelope consists of translucent greenhouse membranes on the sphere surfaces and transparent PVC film, used for windows.